US, 1979, 113 minutes, Colour. James Brolin, Margot Kidder, Rod Steiger, Michael Saks, Don Stroud, Helen Shaver. 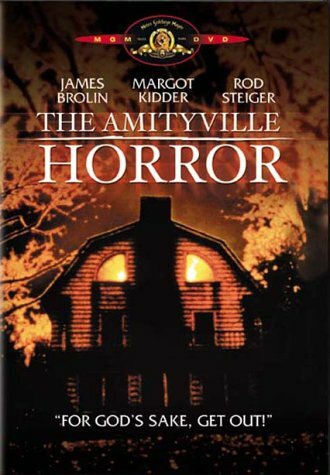 The Amityville Horror is allegedly factual (at least for publicity purposes). This haunted house story has every device that goes bump in the night, all dressed up in post-Exorcist superstitious religiosity. A reasonably pleasant family (James Brolin and Margot Kidder are sympathetic) is terrorised by the memory of mass murders, Salem witches, entrances to Hell and you name it. Rod Steiger as the parish priest receives most of the agony from the house, the Devil and his religious superiors. The screenplay has superabundant holes, loose ends and a gigantic shoal of red herrings, however enjoyment of scary pictures (here menace more than shocks), means, despite the absurdities, contentedly letting oneself go. 1. The popularity of occult films in the 70s? At all times? Audiences' enjoyment of being scared.. imaginative confrontations with evil and the Devil, the religious background, religion and fear? 2. How well did the film create its atmosphere, the technical style for communication of terror? The appearance of the house and its lights and eyes? The angle shots of the house and the repetition of this at sinister moments? The interiors and exteriors and the blend of the normal and the eerie? The cumulative effects, gimmicks? The importance of the editing for shocks? and menace? The overall effect? 3. How well did the film create an atmosphere of menace. fear. heightening ordinary situations into the abnormal? Audiences' acceptance of the basic premises, involvement in all the happenings? Relief when it was all over? 4. The structure of the film - the visualising of the mass murders? The passing of the month, the year? The highlighting of the days of occupation? The build-up to the Last Night? 5. The authenticity of the story? The allegations of truth and facts? The indication of dates and places? How credible was the plot, the behaviour of the Lutz family, the ending? Authentic or not? Contrived or not? A commercial invention? 6. The importance of so many red herrings., loose ends, holes in the plot? Details that led nowhere? The catalogue of all the special effects from the haunted house films and the occult films? 7. The significance of the original crime and its horror, its repetition by flashback? Its place in the memories of the Lutz family? Amy and her companion Jody and the discussion about the murders? The anticipation that the house would possess George and the murders would be repeated? The continued indication and build-up that this would happen? Kathleen and her looking at the news files and the similarity of George to the previous murderer etc.? 8. The introduction to George and Kathleen as ordinary Americans? Their looking round the house, the sales pitch of the lady? Their knowledge of what had happened there? Their wanting the house, attracted by its beauty., their decision to buy it? The introduction to the children and the family status? Their moving in, the ordinariness of unpacking, the children playing? George's plans to have the office at the house. an optimistic future? The contrast with what was to happen? 9. How ominous did the film become with the arrival of Father Delaney? The significance of the priest confronting evil? Rod Steiger's style as a cleric? The family being outside and Father Delaney being trapped in the house.. the build-up to the flies, his not being able to get his breath, the voice seeming to emerge from the flies ? the Lord of the Flies ? his attempts to bless the house? His departure and being ill? The significance of the voices and his interpretation of these? His phone call. the phone burning his hand, the static on the phone? His wanting to return? His growing illness? The confrontation of the superiors and their lack of sympathy? Their holding his psychological training against him? His saying of Mass and his vision of the plaster statues cracking? His blindness? His retirement and suffering? The contrast with his assistant ? a likely looking curate? His Vietnam experience, his secrecy with the detective, his inability to help? The attitude of his superiors towards him? His going to visit Father Delaney? The portrait of the clergy and their disbelief? 10. George and the changes over the days in the house? His appearance, being possessed, his temper, feeling cold? Chopping wood and holding the axe? The clash with his friend Jeff and fighting him? The build-up to the wedding and his not being able to stay? His fighting people, attacking the children? Digging in the cellar? The importance of his research about the flies and the witches? His dream and the possibility of the house possessing him and the murders happening again? 11. The portrait of Kathy as normal housewife, her love for the children, her anguish about George, the experience of the wedding, her growing fears, helping the children, revulsion at George's behaviour, her suffering. her research? 12. The presentation of the children especially Amy and her conversations with Jody and the chair rocking of itself, the importance of the sequence with the babysitter and her being locked in the cupboard? The boy and his hand being crushed by the window? 13. The film's presentation of the phenomena of the house, the rooms, the doors, the windows and their shutting and opening, the importance of 3.15 in the morning and the memories of the murders, the flies and the voice from the flies, the eyes in the night, the cat, the dog, the storms, doors exploding, the oil in the toilets. the blood oozing from the house? 14. The detective and his investigation of the initial murders, his watching the Lutz family and the house, his seeking information from Father Delaney and this coming to nothing? 15. Jeff and his wife and their visit. Jeff's inability to persuade George to come back and take care of his business affairs? The research about the Salem witch? Their going to the house, the cellar, the wife and her psychic communication, the discovery of the witchcraft background, the red room, the Gate of Hell? The images of horror? The importance of George's return to the cellar. the retrieval of the dog, his falling down the hole and emerging covered with oil, his escape? 16. The build-up to the final horror and the credibility of leaving the house? The rain, the car, George's going back, his final escape? 17. Audience belief in witchcraft, the diabolical, religion? What was the audience left with after the experience of the Lutz family, an entertaining horror story, a true horror superstition occult story?